Thinly slice a bit of red onion and marinate in the juice of half a lemon. Chop some heirloom tomatoes, bell pepper, ripe peach, and cucumber. Tear up some fresh herbs and toss all ingredients together. Finish with crumbled feta, olive oil, salt, and pepper. 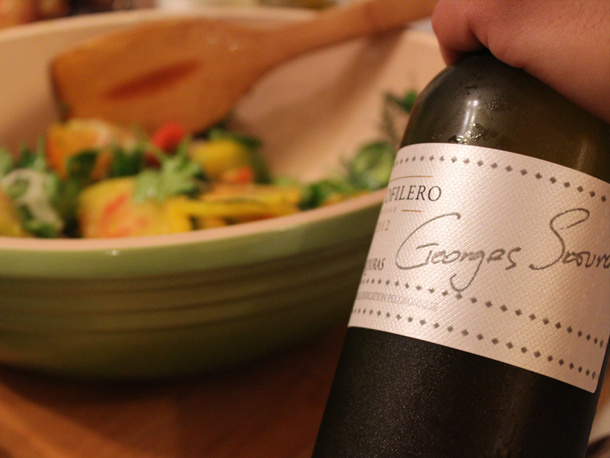 Serve with a crusty baguette and a very large glass of peachy-lemony 2012 Skouras Moschofilero. There’s a reason this “aromatic, high-acid Greek variety” has, as Wine Grapes mentions, “seen a surge in popularity and plantings in the last twenty years”: it’sdelicious. The super-floral scent, lit up with lilies and passion fruit, transitions onto the palate with ultra-refreshing citrus flavors and big acidity that stands right up to this salad’s lemon juice, tomatoes, and pungent herbs. Like Wine Grapes says, “Wines [from the Moschofilero grape] are generally light-bodied, fresh and relatively low in alcohol—often around 11%”—which means you can say yes to another glass and savor the minimal kitchen clean up while you cool down, calm down, rest up and rejuvenate for tomorrow.